I love nature up close- grasses, trees, all organic matter, sinewy and powerful. The angular, curva-linear shapes and marks that make up the world around us are profound when discovered in nature. There is something extraordinary about the movement of grasses in the breeze , the tangle of the undergrowth, the deep pools of pitch black water, the majestic ancient, gnarly trees with twisting branches reaching to the sky . These are the images that have influenced my work. Over the past two years I have taken my painting outdoors . Plein Air painting is a whole new way of looking at the world around us; it creates a new way of seeing, and gives us a new language for capturing the three dimensional on a two dimensional surface. Many of the field studies done en plein air have resulted in large scale paintings reproduced in the studio. My intent has always been to paint big paintings for big impact, allowing the viewer a glimpse into the finer tunings of nature. Color interpretation and exploration have been fundamental to these larger works. Playing with color is my passion – creating new colors in varying hues and values, and finding a complimentary shade that makes that color almost jump from the canvas. I am a modern-day impressionist. I believe that the beauty of any entity lies in the impression it makes on us, that first emotional response we have when we witness it in all its glory - and that is what I paint. Having a studio in the ArtHouse has provided me with a quiet space to pursue my art and be inspired by other artists. I use my art for escapism not to produce volumes of work. As most people attest to these days, life is fast and furious with not much time to just breathe. Art revives and refreshes me. I am presently working on a show with two other artist for later in the year. My life as a semi retired event planner and decorator still keeps me busy and helps to inspire my sometimes elusive muse. I just returned from ten days in San Miguel, Mexico where I participated in some inspiring art workshops. I am anxious to put into practice what I learned in Mexico and put together a new series. My studio in the ArtHouse has enabled me to get my art out in front of the community. Having a space to work that is separate from home gives me a sense of credibility as an artist. People recognize me and my work and that fills me with a sense of great connection! I have a place to meet clients and to teach painting and drawing classes. 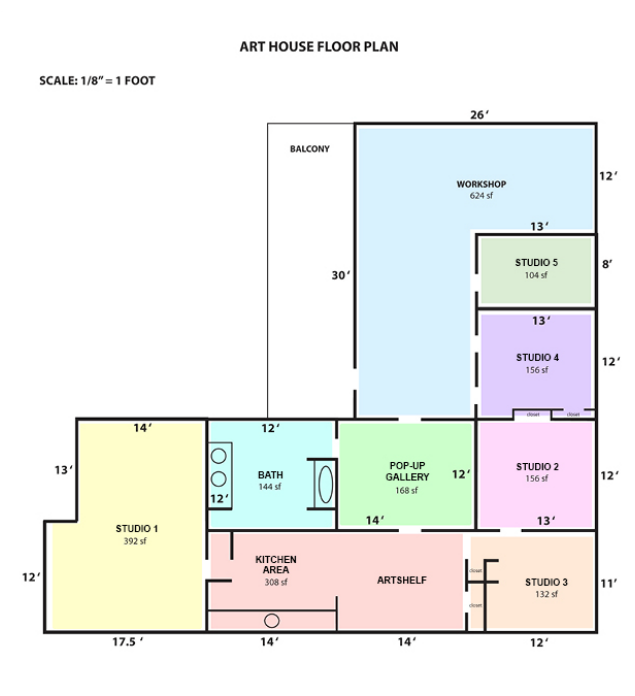 Artists Studios available for rent monthly. In October 2013, the Lake Country Art Gallery held it’s grand opening of the Art House, containing a new dedicated art workshop space for arts classes, plus artist-run gift store (now moved to Gallery side room) and 'Artshelf' (2nd hand Art books and reading room).